Ding Jianhua, the 44-year-old man from Hangzhou city of Zhejiang province, makes clay sculptures. The polymer clay he uses has high ductility, which resembles plasticine. 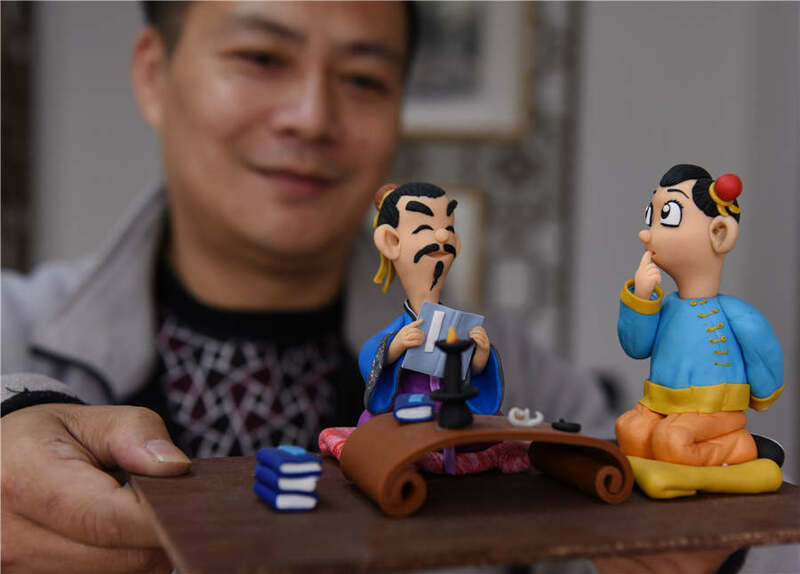 He became interested in kneading plasticine in childhood, and he has created figurines of Sun Wukong, Huo Yuanjia, Guo Jing and other characters from his favorite TV dramas using plasticine. When he was in the third grade, his creation of the figurine Yue Fei once won a craft art award in the city. Ding, who works in a travel agency, creates clay sculptures after office hours and his house is full of colorful creations. He first draws the patterns on the paper, and makes the basic shape using clay, then matches different colors. Ding believes that each of his creation is unique as they carry his thoughts and accumulations of many years. Ding said that he has responsibility to promote the clay sculpture and the skills, so he often teaches children how to make clay sculptures.